NEW Amazing Calabogie lake front cottage!! Available most Mon, Tues and Wed nights throughout the summer. Cottage with lakefront beautiful views. Private dock for swimming and fishing. Backyard POOL, fire pit, screened in porch and sand box! Perfect for a summer getaway and family trip. Book now. Cottage fits two families of 4, total of 8 people. Extra per person fee applies after the 4th guest. Main floor has a cute renovated kitchen, bathroom, dining room, living room and sitting area. 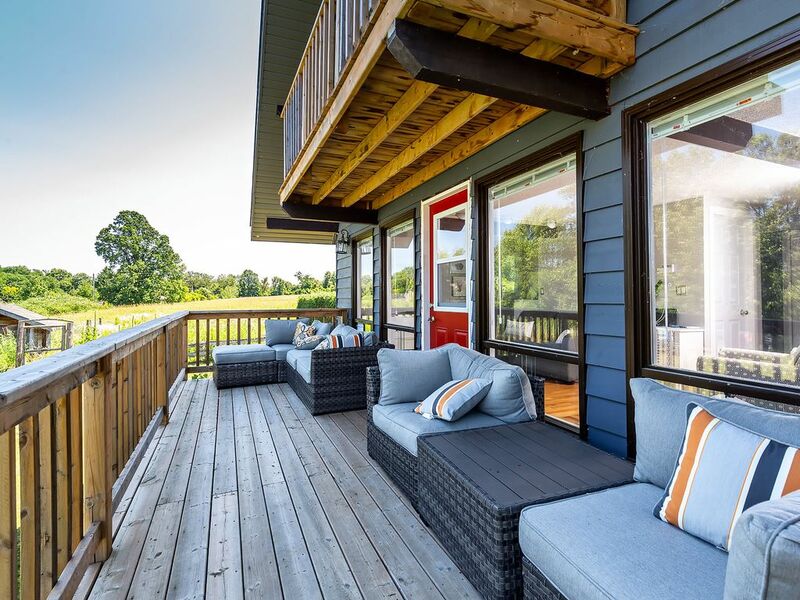 All overlooking the lake and porch with new comfy outdoor furniture. Two bedrooms upstairs with luxury linens and top of the line queen mattresses. Both rooms also have a daybed with trundle and two single mattress. Each room can sleep a 4 person family (a queen bed and two twins). One bedroom overlooks the lake for stunning morning views and a Romeo and Juliet balcony. The backyard has a screened porch and bbq for bug free dining and evening hang-outs. The screened in porch overlooks the pool, sand box, picnic table and fire pit - all in the backyard. All the amenities for summer time outdoor play. The front yard has a wonderful porch overlooking the water. A short stroll down to the lake awaits the lake for swimming off our private dock. You will have access to 2 kids kayaks for outdoor adventures! This cottage has everything you would like for amazing family fun. The cottage is set up for families. The well is a shallow well. Please bring your own large cooler water bottles for drinking water. The kitchen is stocked like a full-time home with all the luxury amenities and appliances, including a dishwasher. Hello. We are a family with two young kids willing to share our little slice of heaven and relaxation. We love coming up here and relaxing and enjoying recreational activities. We live full time in Ottawa but have set up this cottage like a full time second home. This spot is a gem, vast waterfront views, walking distance to GOLF, onsite private pool and dock. Calabogie is an awesome spot for fishing and recreational activities. There is even an ATV rental down the road.